Sumabe® LingZhi 5000 provides support to the immune system, supports healthy liver detoxification processes and assists in protecting the body from free radical or oxidative damage. It assists the health of the cardiovascular system by helping to maintain normal cholesterol levels and healthy blood pressure in healthy individuals. Ling Zhi 5000 assists in the maintenance of general wellbeing. 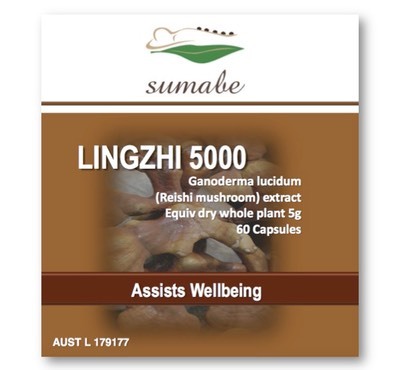 LingZhi 5000 contains an extract from Ganoderma lucidium, which is traditionally used in Chinese medicine to strengthen the body and reduce fatigue and listlessness. Traditional uses include the relief of wheezing and cough, sleeplessness and insomnia, to strengthen poor digestion and to improve the appetite. Adults: Take 1 to 2 capsules daily with meals, or as directed by your healthcare professional. If symptoms persist, contact your healthcare practitioner. Not to be used in children under two years of age without medical advice. Assists in the maintenance/supports the health of the cardiovascular system. May help maintain healthy (and or normal) cholesterol levels in healthy individuals. May help to maintain cholesterol levels within the normal (and or healthy) range and improve HDL:LDL ratio in healthy individuals. May help maintain healthy (and or normal) blood pressure in healthy individuals. Supports/helps maintain healthy immune function. Provides support to the immune system. Contains Ganoderma lucidum, which has antioxidant activity and may therefore assist in protecting the body from potential free radical damage. Has antioxidant activity and therefore assists in protecting against oxidative/free radical damage. Supports healthy liver detoxification processes. Ganoderma lucidium has a long history of use in Traditional Chinese Medicine to reduce mucous congestion, relieve cough and reduce wheezing. Ganoderma lucidium has traditionally been used to reduce cough due to cold and coughs with excess phlegm. is traditionally used to relieve cough, wheezing and difficult breathing. Contains Ganoderma which has a long history of use in Traditional Chinese medicine to support the respiratory tract. Contains Ganoderma which is used in Traditional Chinese medicine for respiratory health. In Traditional Chinese Medicine Ganoderma lucidium is used to strengthen the body and tonify qi and blood. Ganoderma lucidium has a long history of use in traditional Chinese Medicine for the relief of sleeplessness or insomnia. Ganoderma lucidium has traditionally been used in the Chinese Medicine system to reduce fatigue and listlessness. 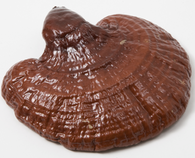 In Traditional Chinese Medicine, Ganoderma lucidium is used to strengthen poor digestion and improve the appetite. Contains Ganoderma which is used in Traditional Chinese medicine to strengthen and support gastrointestinal function. Aids, assists or helps in the maintenance of general wellbeing.